WINNETKA, Illinois — He is a custodian and now he is a millionaire. Dave Martinez bought a winning scratch off lottery ticket at a North Suburban gas station last month in Illinois, CBS Chicago reported. His co-workers at New Trier High School couldn’t be happier. This is the story of something good happening to a good person, his boss said. In fact, he works so hard and so fast, that Martinez has a nickname. “If there’s anybody I’d pick to win the lottery, it would be Dave,” Conway said. 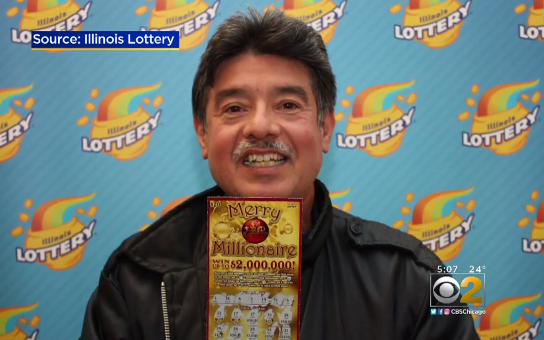 Martinez’s big winner was a “Merry Millionaire” scratch off ticket. It took a bit for the full amount to sink in. “I thought it was only $100,000 at first. Then I read it again and it was for 20 years,” Martinez said. For two decades, $100,000 a year. Martinez has no plans to hang up his broom earlier than next year’s scheduled retirement date. People at the school are like family. He has worked there for 34 years. “Oh yeah, it’s always important – friends, teachers, professionals, everybody here. We all try to work together as a team,” Martinez said. He is also a crossing guard and works school football games, too. “He’s just that dedicated,” Conway said. Something good has happened to a good person. “I am really full of joy,” Martinez said. Dave Martinez did treat himself to a new car and plans to make some investments and share his windfall with his wife, three adult children and two grandchildren. He bought the $2 million winning ticket the day after he bought a $100 winner from the same Gurnee gas station.